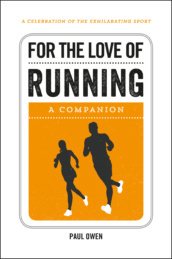 For the Love of Running, ISBN: 9781786850157 - available from Nationwide Book Distributors Ltd NZ. Running is the simplest, most natural, the most wildly liberating and gloriously exhilarating of sports. Collected here are all the most fascinating insights into the world of running - from its illustrious history to the modern day greats - that you will ever need to inspire your next run, wether it's a 5k or an ultramarathon.